I was looking through posts on UCreate the other day when I came upon this post about a web site called "Wordle." Word art is really big right now and this program lets you type in any words you want to make a collage. It's really fun to play with. You can change your font, colors, and all sorts of other details. Eventually Rex's cowboy room is going to become Baden's and Rex's new room will be a super hero room. (You'll see a bit more of that in the next few months.) 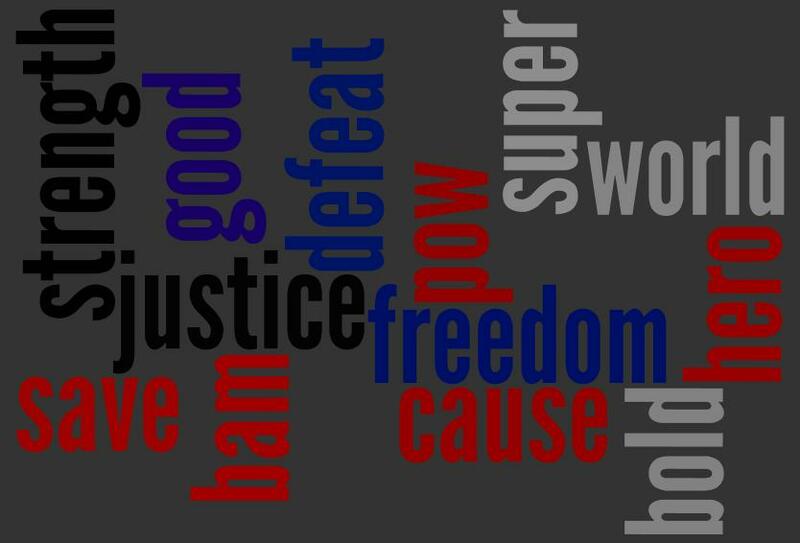 Anyhow, I thought it would be cool to make a superhero wordle for the upcoming room. Here's mine. I'll probably play with it more before I print it and I was also thinking of layering it with another image to make it look old. We'll see. So, head on over to Wordle and play. Just so you know, saving your image is a bit tricky. You have to do a screen shot and then paste it into Paint and crop it. They explain it in the FAQ section. If you find an easier way, let me know. Thanks for reading. Have a fabulous day. That is so cool! I love what you did with it! You have got to come do my kids' rooms. Actually, if you could just come do the whole house, thanks. Oh I love Wordle!!! Such a fun site! I was actually planning to post on it too, I used it for part of my dining room decor. :) And I love how it turned out! Cant wait to see the new boys room, super hero theme! HOW FUN!! :) I love all your designs and decor!! Wordle has been a personal fav of mine for quite some time now. I made "a nina is" and "a papa is" for my grandparents and had all of my siblings and cousins come up with words to describe them I also did one for my son for his room! I printed them out 8x10 format and put them in 8x10 frames! I think I saved mine a different way I don't think I did a print screen image. wordle is amazing! my husband and i used it for a family newsletter we sent out a few months ago. it made it so easy to create the graphic for the front of the letter. the only bad thing is how much time can be wasted on the site! I will check out wordle for sure! What a cool idea..would be great for so many rooms in a house. I'm thinking something for a spare room or bathroom with relaxing words. Thanks for the reminder. I had forgotten all about Wordle until I read your post. It's too fun...I used it to design a quilt top (all the letter were machine pieced). I love wordle!! I use baby words for babyshower gifts, I've used wedding and love words for a bridal gift. I even did the proclamation to the family and added our names in it for a gift for my parents. It's my go to present site. Hello! You should try www.tagxedo.com. It does the same thing as wordle, but you can put your words into another shape! Oh, how cool! Thanks for sharing! And thank you, Mrs. G, too, for sharing that link :). you can "print" the document as a pdf file. this will save the file to your own computer. you can't make changes to it but it may make it easier to print. BTW, HUGE fan, thanks for a GREAT blog!